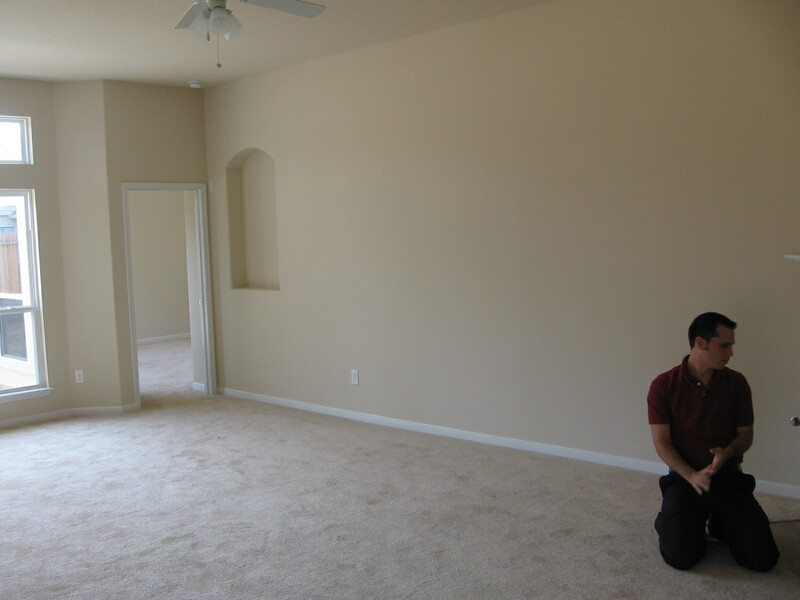 Here is what my living room looked like when we moved in. 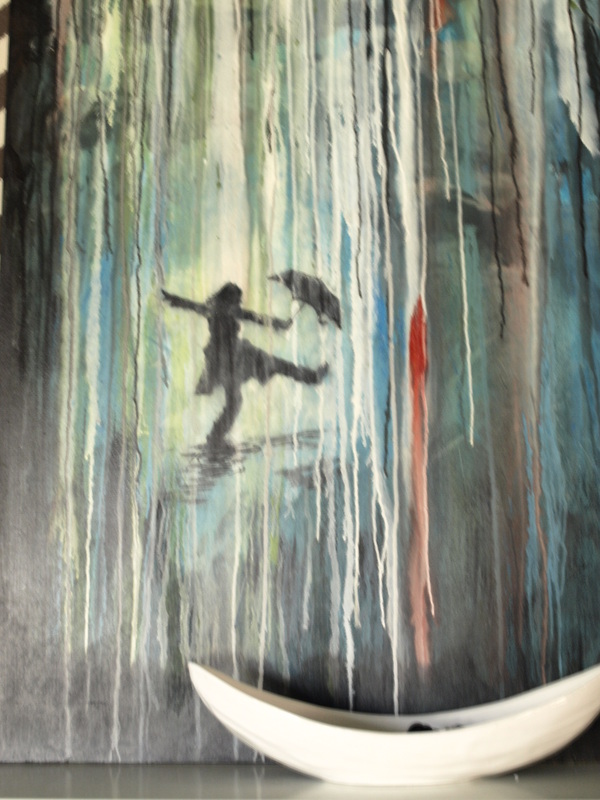 And heres what it looks like now (sorry, the photos are a bit grainy. I’ll take more next time my house is this clean…it might be a while…) :). This is the view from the front through the entryway hall. 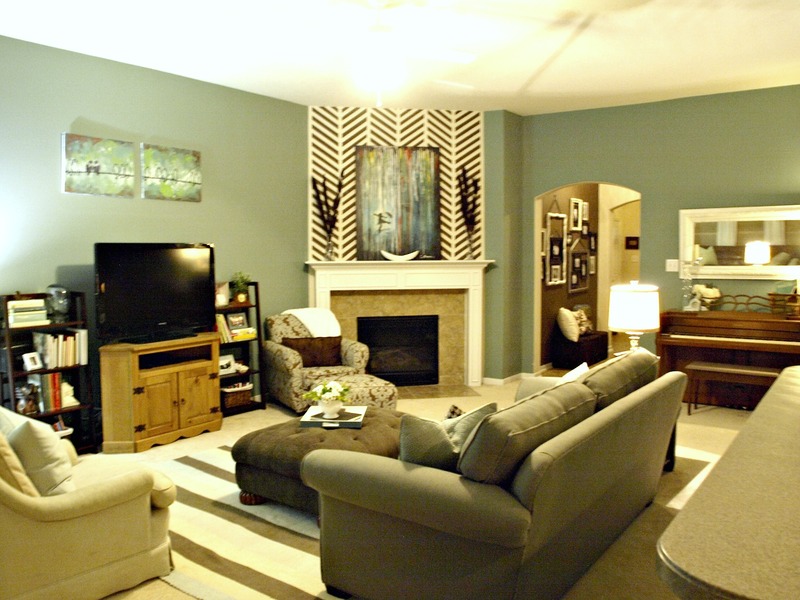 -The fact that I spent less than $60 on each item in this room except for my hubby’s tv and our sofa. Its true. I’m addicted to thrift stores and craigslist and my home is almost completely furnished by them. – I LOVE my rug! 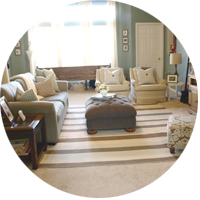 It is actually two striped cotton 5’x8′ rugs that I got at BigLots and lay together to create a big rug. 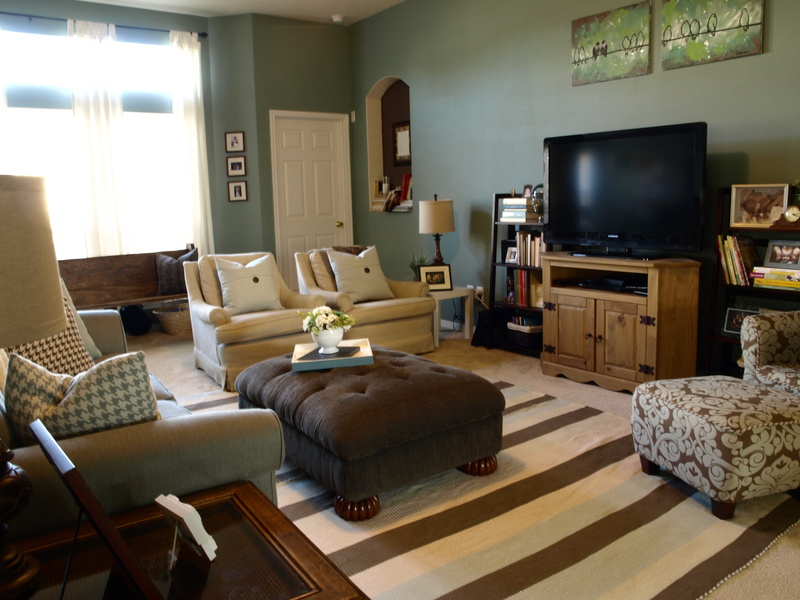 *TIP* You can and SHOULD use rugs on carpeted floors. View your floor as another surface to decorate. 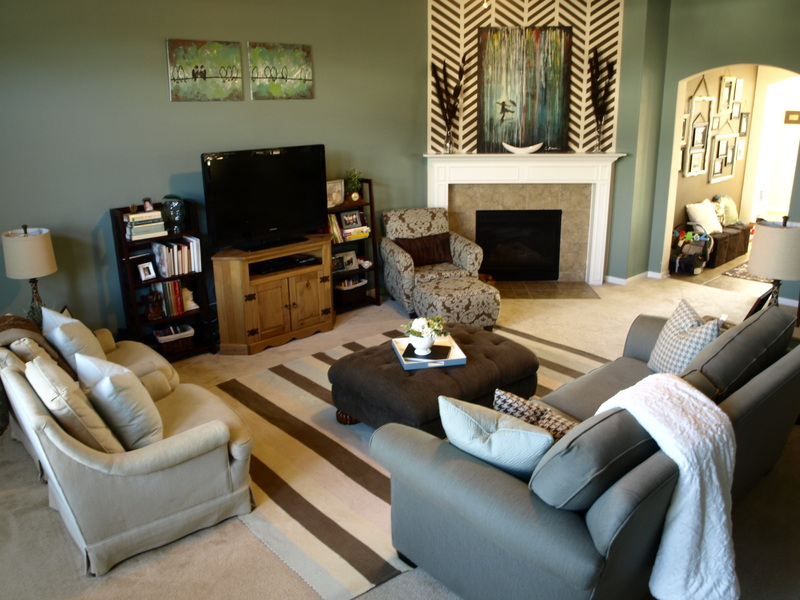 Tie your room’s colors together with your rugs and ground your conversation areas by aligning furniture so that it surrounds (or as I prefer) or sits on top of your rug. – The accent chair and ottoman at the bottom right of the photo was a $50 craiglist find that I reupholstered with the help of a friend (THANKS AGAIN LINDA!). The fabric was a steal and the whole thing only cost $110 when all was said and done. 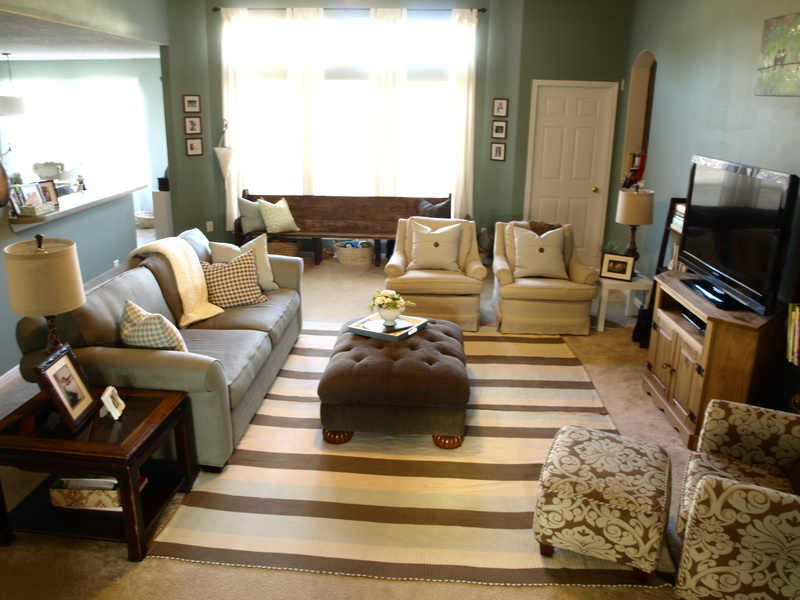 I like to get fabric and rugs on clearance at HomeFabrics and Rugs. 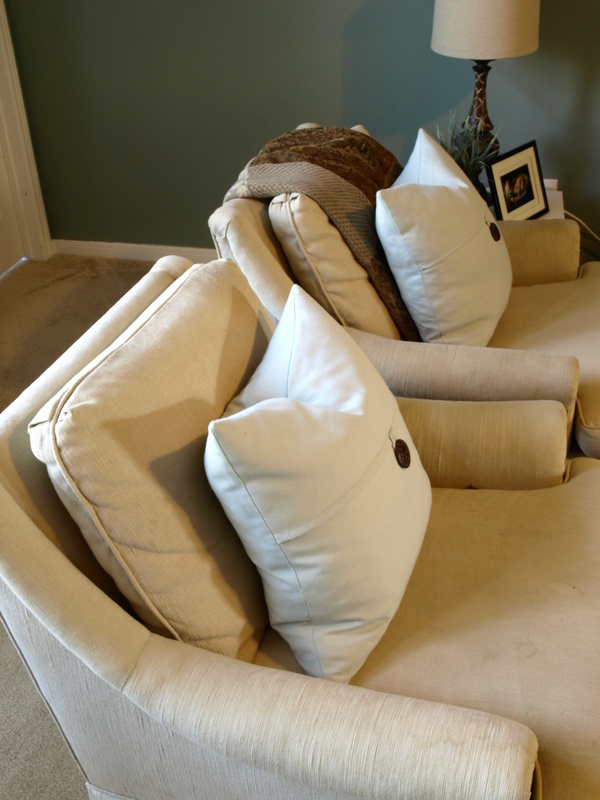 – The button tufted ottoman is great and I got it at a thrift store for $20. Design wise I’d prefer a coffee table but you can’t beat the comfort of being able to kick up your feet when you’re watching TV and I especially love that I don’t have to worry about bumps and bruises on my baby’s noggins as they run around in there. – The two back chairs are super heavy duty Ethan Allen chairs (the Albert chair), originally $999 on their site, that I got off of craigslist for $50 a piece. The upholstery is a bit stained (they were in a salon) so I am in the process of making some tailored drop cloth slipcovers for them. 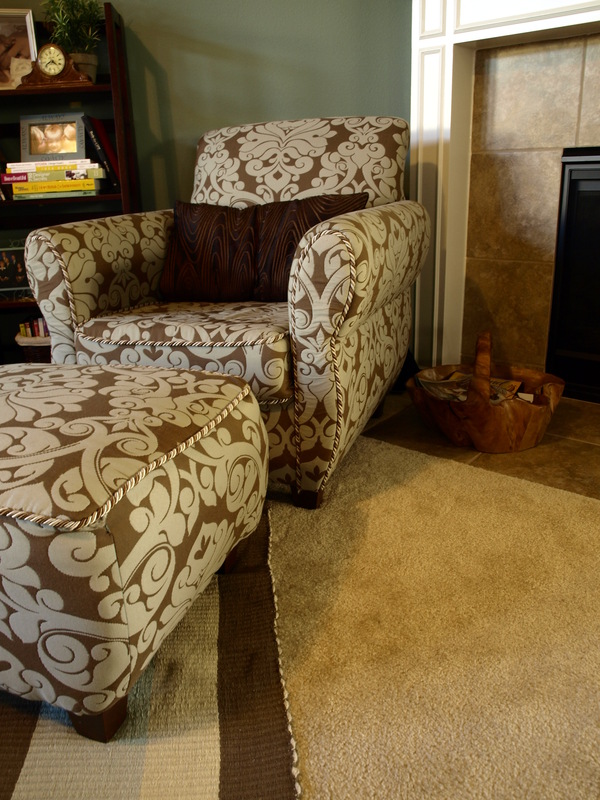 Slipcovers are FANTASTIC for families with kids or for people who like to change their decor a lot without having to buy all brand new furniture. – My bamboo matchstick roller shades were $7 each from BigLots and create privacy while bringing a natural element and texture to the room. The curtains are off-white curtains from Ikea for $12 for a 2-pack. They soften the large windows without being to overdone. I personally like more casual window treatments. 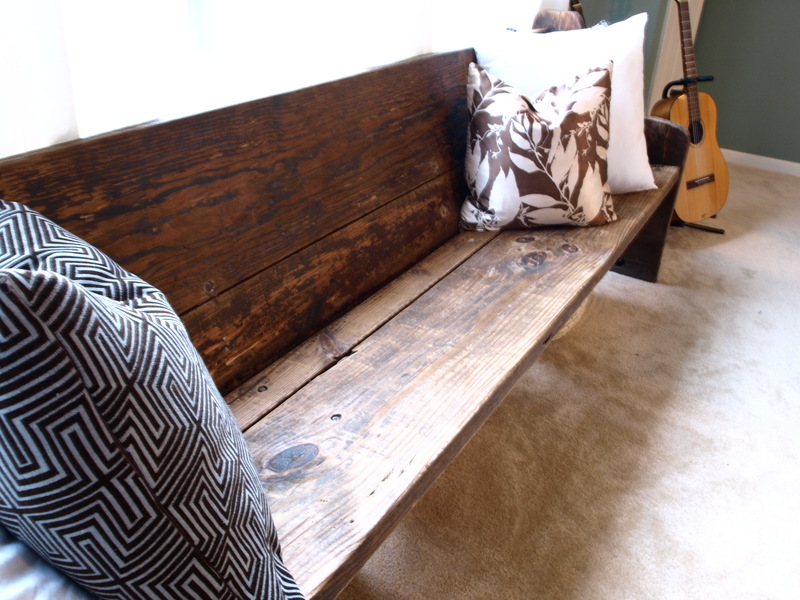 – The long crusty wooden bench under the window is probably my favorite thing in the room. 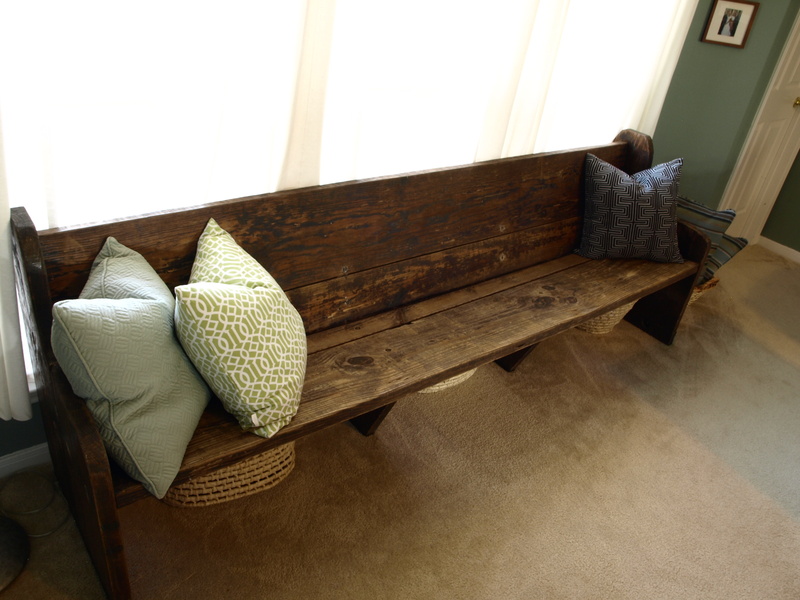 It is an old church pew that I found on craigslist for $30. It took some convincing to my husband to let me bring this massive thing home but he loves it as much as I do now. The lady who I bought it from said that someone had left it in the yard of the house she moved in to. She seemed skeptical when I said I wanted it INSIDE my house. She asked me if I was going to paint it and I said, “NO WAY. I love the crustyness of it!”. Although, I did clean it thoroughly and sanded back some of the really crusty parts and then sprayed the whole thing with polyeurothane so that it wouldn’t chip any further and get on people’s clothes. 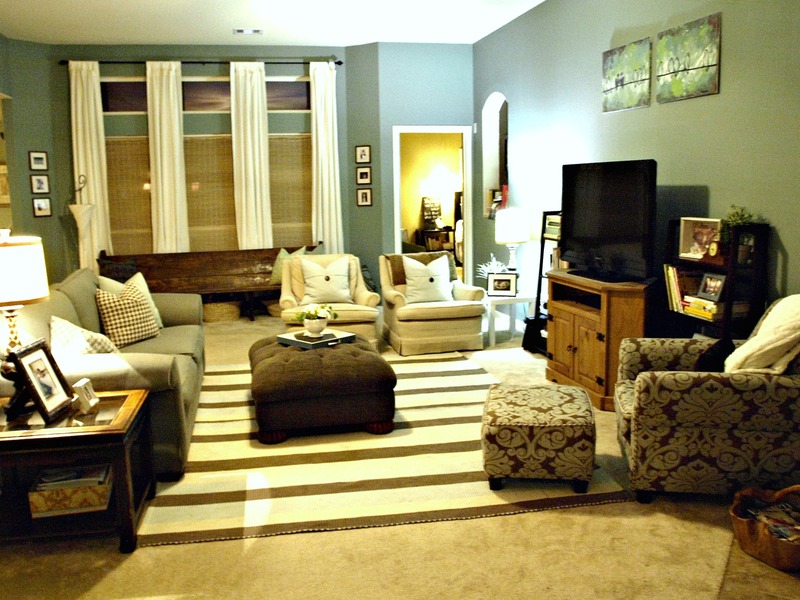 It fits PERFECTLY under our huge window and provides tons of seating when we entertain. It is also a great place to store toy baskets for the kids since we don’t have a playroom. I’m just IN LOVE with it. 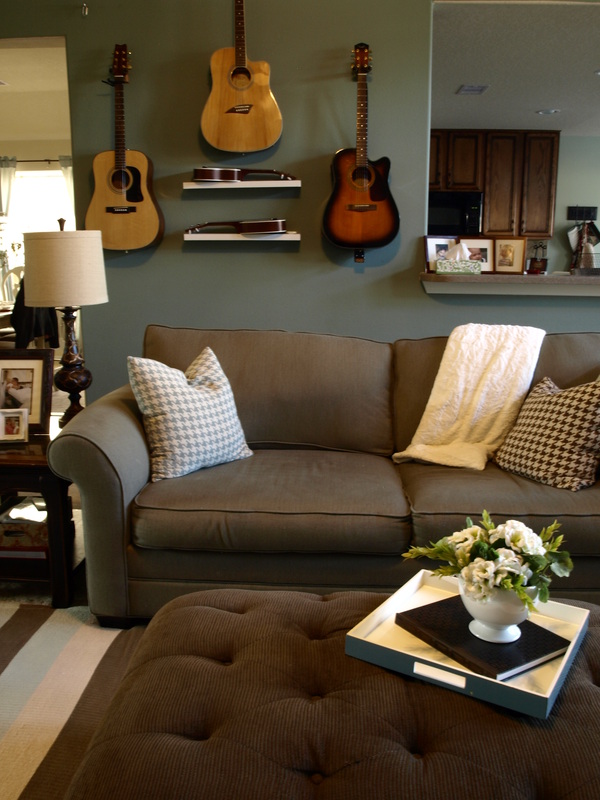 – The sofa was bought for $600 from an RC Willey Outley center. 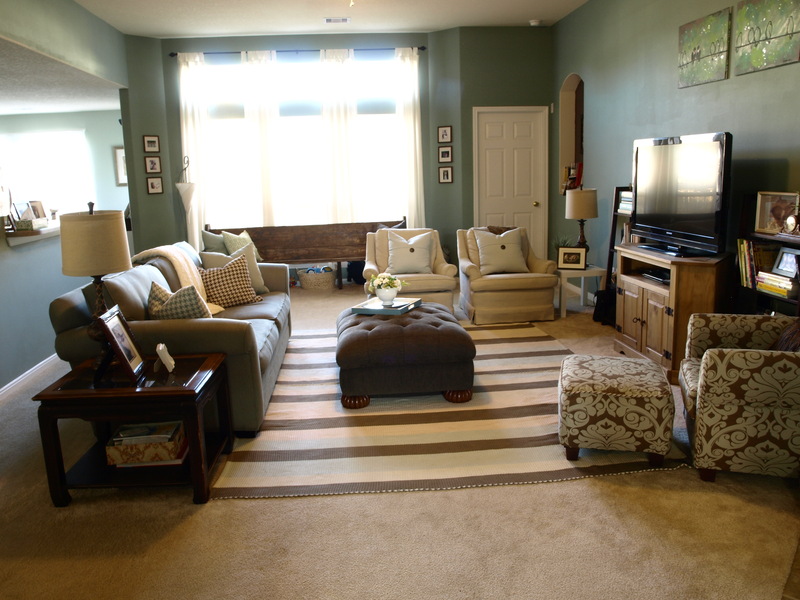 It is a wool blend dusty green-blue color (like the walls) with a small brown herringbone pattern. 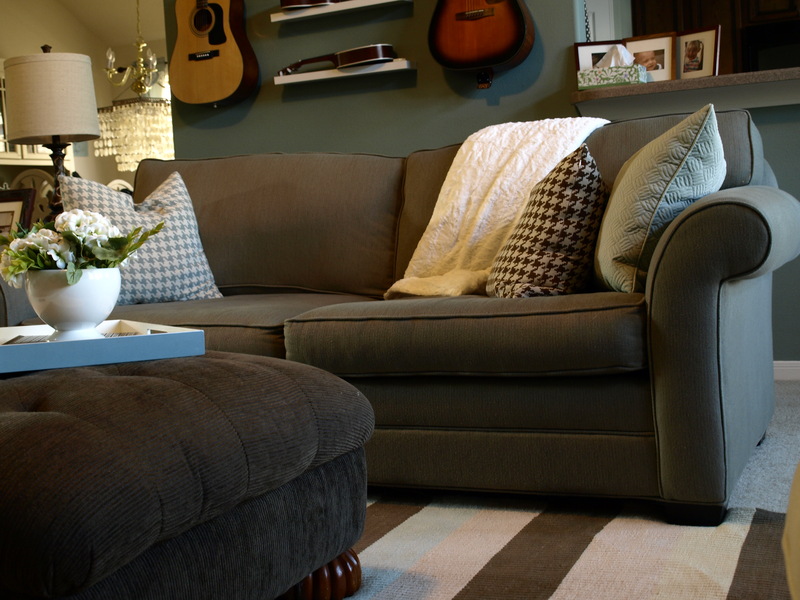 *TIP* Research the kind of upholstery you’d like before you buy. 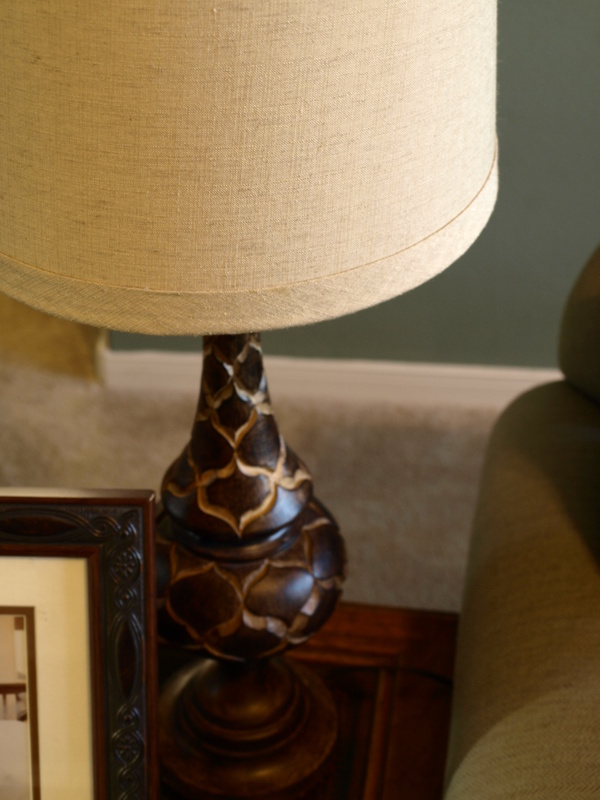 For example, wool blend upholstery will pill (just like a wool sweater) over time and wear. I knew this going into it and counter the problem by shaving my sofa with an upholstery shaver (you can find them at fabric stores or online) once a month or so. I also use a fabric protection spray to deter spills and grubby hand prints. 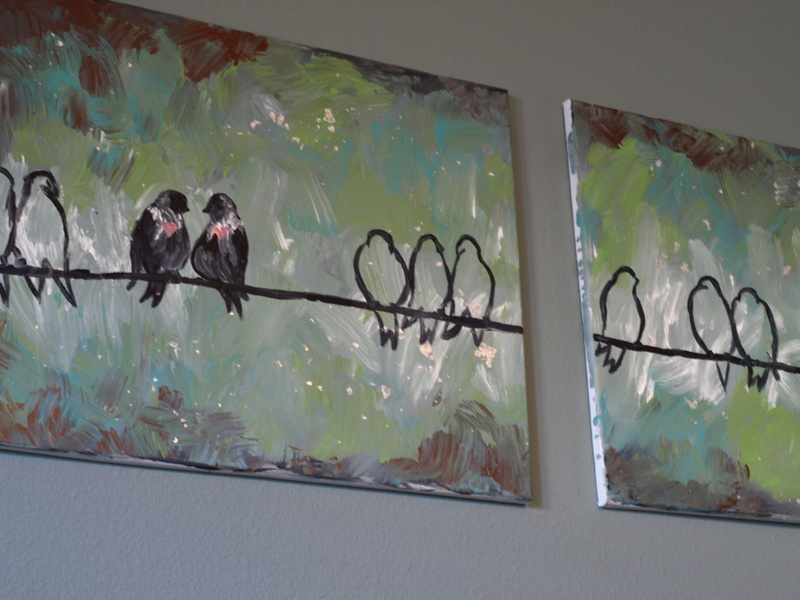 – The artwork is my own original art that I swap out whenever I get that “itch”. 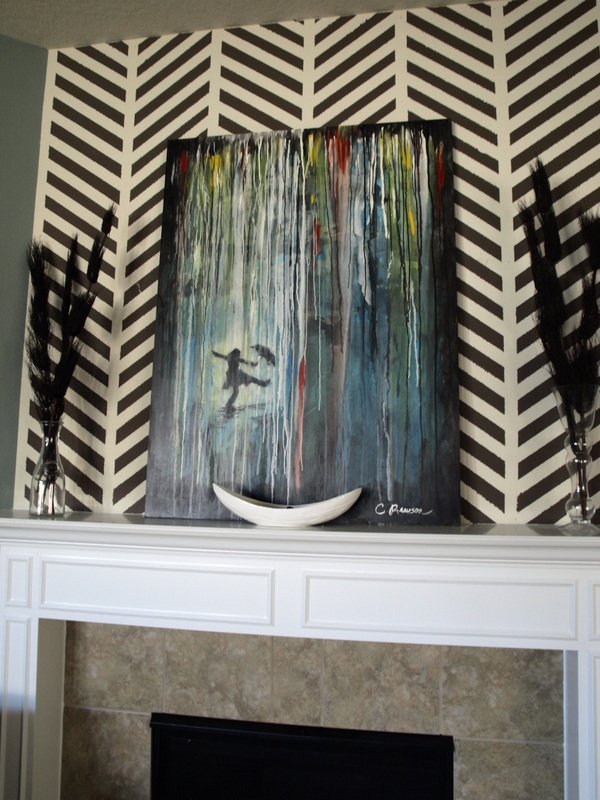 – I wanted to really make the fireplace a focal point so I taped off and painted a chevron (or herringbone like my sofa) pattern from the mantel to the ceiling. 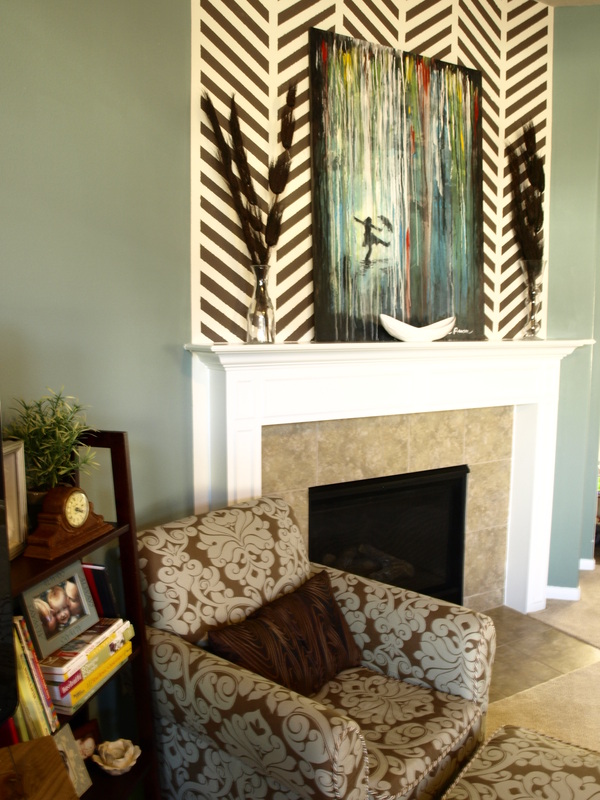 I used the same paint as my entry hall color (as you can see a bit from the pic below) and my entryway tree color. – Into the hall you can kind of see (in the pic below) my little framed up family photo gallery. I hang framed black and white photos in groupings inside and around larger empty frames that I hung off of coordinating ribbon. Below the gallery wall are 3 storage ottomans with pillows on them that we bring in when we need more seating (we like to have people over), and keep diapers and wipes in since, lets face it if you’re a mom you know, we do more diaper changing on the living room floor than on the changing table. 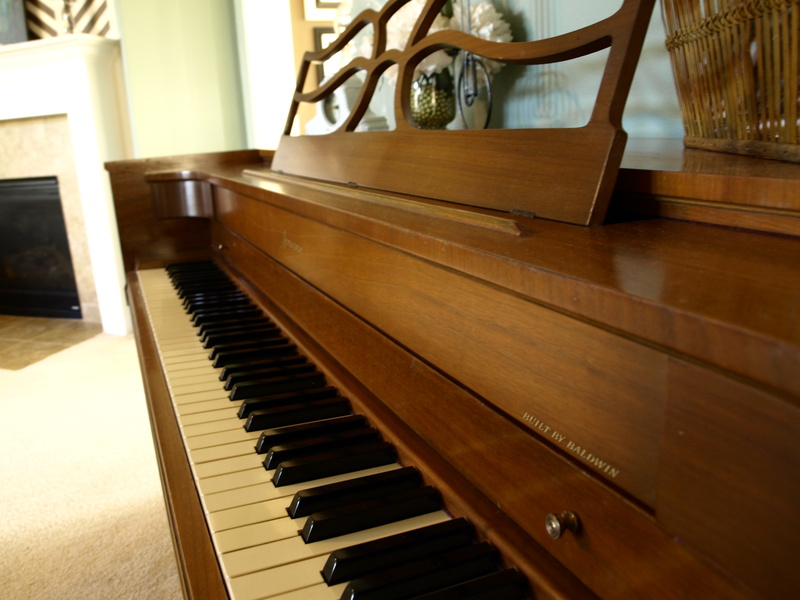 – The piano is a vintage 1962 built Acrasonic that my hubby gave me for my last birthday. It is in near perfect condition and I LOVE IT. 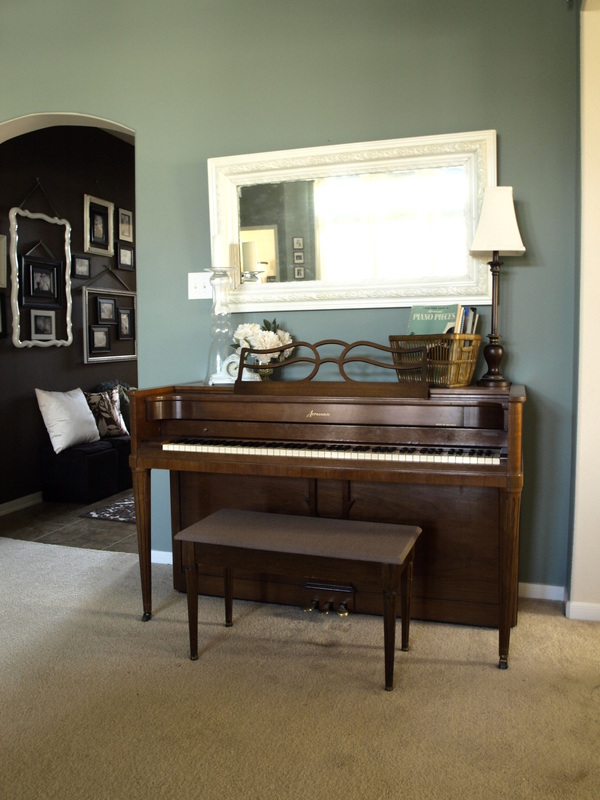 My hubby and I like to write music on the piano and guitar and sing so this room houses all our music stuff. The mirror over the piano is an antique I got for $9 and spray painted white. This is the wall opposite the TV wall that we hang our guitars and ukuleles on. Instruments are beautiful so DISPLAY them. 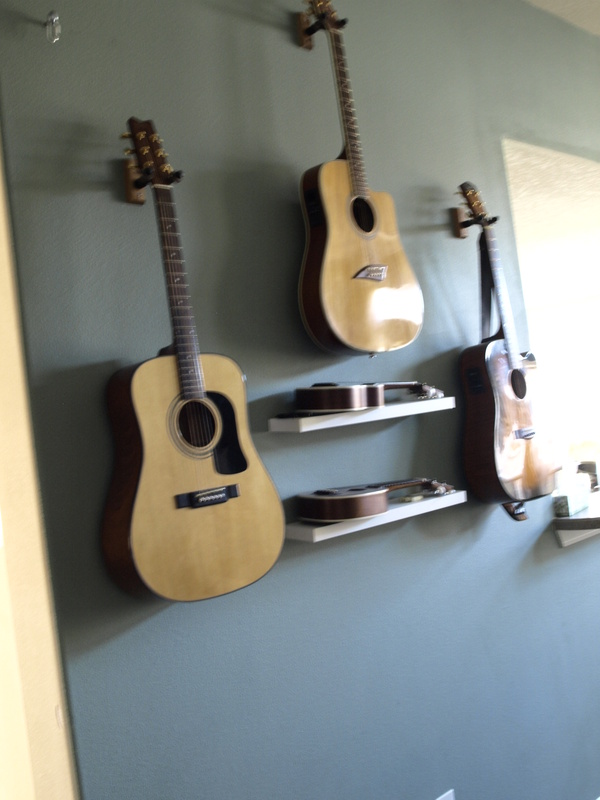 Also, hanging the guitars up keeps them out of reach of the little ones. This is the view from the back from the kitchen area. And thats my living room! I love it, and keep changing it so I’m sure there will be more pics to come. 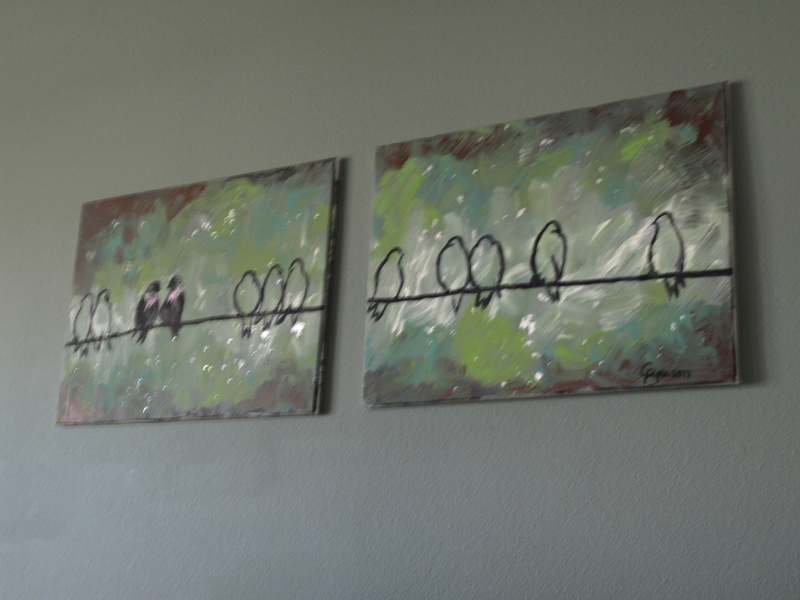 To tell you the truth, now that its pretty much complete, I want to completely re-decorate! But I guess thats the plight of being a decorator. I just can’t get enough. Hey guess what!? I cleaned again! ;) Heres some better photos. Haha! In the photo above don’t you just love how I have my new capiz shell chandelier (a $25 craigslist find) hanging from my ugly brass dining room chandelier in the background. Class-y.